Prism was the first RISC technology program at DEC to reach product development status. MicroPrism was a CMOS microprocessor that implemented the Prism architecture. Dan Dobberpuhl was the project leader; Rich Witek was the architect. MicroPrism was implemented in 1.5u double-metal CMOS (CMOS2) and operated at 50Mhz-62Mhz. MicroPrism taped out in April, 1988. The entire Prism program was cancelled in June, 1988. First pass parts were completed and were shown to be mostly functional. 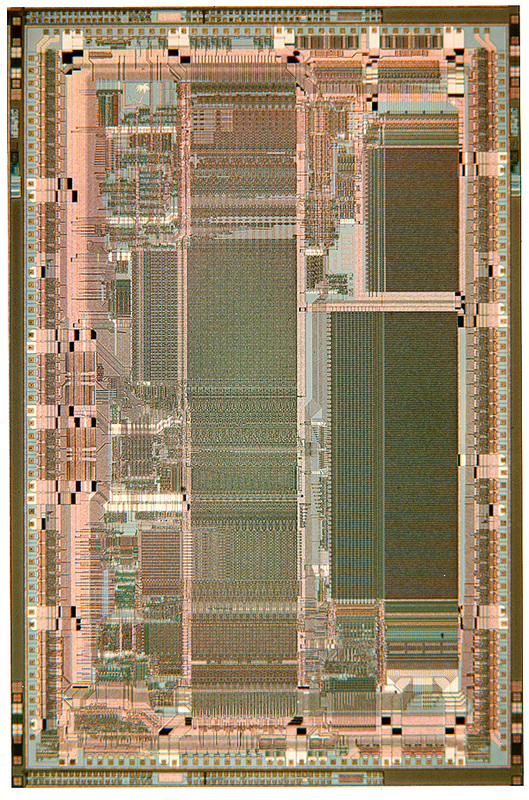 HR32 (a 32b coprocessor proposed by the Dan Dobberpuhl and Rich Witek). In 1985, Jack Smith unified all the competing projects and named Dave Cutler to lead the resulting program. Dave's team created a new architecture named Prism. Prism was initially a 64b RISC system, but it was changed to a 32b system with vector and 64b extensions, focused on technical computing. Prism had a unified 64 entry register set. It included a concept called epicode that implemented privileged operations in normal machine instructions. Two CPU implementations were started: a mid-range ECL system called Crystal (designed at DECWest) and a microprocessor called MicroPrism (designed by Semiconductor Advanced Development). Dave Cutler's team was also designing a new operating system to support Prism. This operating system offered some degree of VMS application compatibility but was more focused on providing a robust Unix environment. From the outset, Prism was beset by difficulties. The two competing VAX ECL system teams (Aquarius, later the VAX 9000, and Argonaut, later cancelled) viewed Crystal as a competitor. The VMS and Ultrix groups viewed the proposed new operating system with suspicion. MicroPrism had to compete for resources with CVAX and Rigel. The closure of the architecture spec was delayed by questions of 32b vs 64b, commercial versus technical focus, and so on. As a result, the uPrism CPU was unable to start full implementation until September, 1986. Work on an FPU (derived from the Rigel FPU) and cache controller (derived from the Rigel Cache chip) was planned but interrupted by an edict, in mid 1987, to make Prism a 64b architecture from the outset. This was rescinded a few weeks later, and instead the Crystal systems project was cancelled. MicroPrism, the only remaining hardware implementation, was directed to focus on high-performance Unix workstations, but the project had been grievously delayed. The team scrapped the cache controller and deferred the FPU in order to concentrate on the CPU chip, which taped out in April, 1988, months behind schedule. Earlier in 1988, a group of workstation designers in DEC's Palo Alto office, fed up with the delays, took matters into their own hands and decided to build a Unix workstation around existing Mips chips, using the existing Ultrix operating system. In 90 days, they produced a working prototype with a working operating system. They then proposed that Prism be cancelled in favor of using the Mips architecture. The rationale was that using the Mips chips would allow DEC to field a UNIX RISC workstation by January, 1989; since MicroPrism's FPU had just been started, using Prism would delay availability by a year or more. The competing Mips and Prism proposals were evaluated by the company's Executive Committee in June, 1988, and Prism was cancelled. Dave Cutler left the company for Microsoft within a year. Dan Dobberpuhl and Rich Witek left the Microprocessor Group to work in Advanced Development (eventually on EV-4, the first Alpha). I hadn't had much personal involvement with Prism, up until the very end. Running the Microprocessor Group, writing VAX microcode, and trying to avoid collateral damage from the VAX ECL system wars, had kept me busy. But as part of the runup to the June Executive Committee meeting, I was asked to evaluate the competing proposals. In a triumph of analytical purity over common sense, I concluded that the Mips proposal would cost less and reach the market sooner. For failing to back my own team in its moment of crisis, I was barred from higher management roles in the Semiconductor Group. In September, 1988, I was "promoted" from manager of the Microprocessor Group to Technical Director of Semiconductor Engineering and leader of the Alpha Program Office. I did not hold a line management job again for eight years. MicroPrism was presented at the 1989 International Solid State Circuits Conference.